The second of three Corridor Development Initiative meetings last week collected more detailed feedback about what Logan Square residents hope to see replace a municipal parking lot and under-used bus transfer plaza atop the neighborhood’s ‘L’ station. The meeting began with a brief audience survey whose results mirrored the findings from the previous meeting. During a short question-and-answer session, one attendee mentioned a recently confirmed proposal to develop the nearby Megamall property, which could include the grocery store that had arisen as a priority in the earlier meeting. The bulk of the meeting focused on an exercise where small groups of participants stacked blocks of wood together, Lego-like, to visualize how different uses could fit into buildings and open space on the site. The resulting configurations evolved as individuals voiced different opinions, but all of the groups came to broadly similar conclusions: Housing should take the lion’s share of the space, especially on the tucked-away northern end, some retail should face the station, and a park should separate the two. Respondents either ignored parking, shoved it off to the side, or tucked it under the housing. There was significant support for higher densities than the three stories typical of the surrounding neighborhood, with many groups presenting five-story buildings that could maximize the number of affordable housing units. One group even suggested a hotel, given the lot’s location between the Loop and O’Hare Airport and its great skyline views. Some attendees questioned the need to have a large bus depot, since many of the bus routes that once served what had been a major transfer terminal have been cut in the years since. Reducing the size of the turnaround would free up more space for buildings or park space, while removing the turnaround entirely could simplify the awkward route that the #76 Diversey takes and thus improve bus reliability. Participants learned about how different land uses could be combined on the 1.5-acre site. Handout courtesy Metropolitan Planning Council. 35th Ward Alderman Rey Colón said that he was happy with the unique opportunity that the CDI has provided to give the community a chance to proactively detail its needs and wants, rather than just making comments on a plan from outside. However, he expressed disappointment at the lack of diversity at the meetings: only 20 percent of those attending this meeting identified as Latino or Hispanic, in contrast to 50 percent in the surrounding neighborhood The alderman said that could be because many area residents work long hours, which leaves little time for extra activities such as evening meetings. Yonah Freemark of the Metropolitan Planning Council agreed with Colón’s assessment of the meeting’s diversity. Freemark reiterated MPC’s commitment to making the processes as open as possible, through outreach to neighborhood institutions, translations of all meeting materials, and a new “vote by text” system that garnered over 135 replies in its first week. The third and final CDI meeting will be next Tuesday night, September 30, at 6 p.m. at 2810 N. Milwaukee Avenue. There, a panel of development experts will provide their feedback and analysis of the various development scenarios that residents crafted at the second meeting. It could be that Latinos in the neighborhood are more likely to have children, so they don’t have several spare hours in the evening to play urban planner. I’m a parent and managed to spend a couple evenings at these meetings “playing urban planner”, as you so condescendingly put it. There were others who brought their children to these meetings. Maybe the flyers and other publicity should explicitly make it clear that it is ok to do that? So much wasted effort, time, and money all to appease the masses. This has a very simple answer, “Highest and Best Use”. Absolutely. These meetings spin everything is wonderful and you as a community member are left thinking you have a voice and can get what you want. However, in reality, a couple of things happen. 1) Things stay the way they are. Mainly because a landlord/business owner may have owned the property for years and has no future plans to change anything. Time passes. A few years down the road when the owner is selling or considering selling, meanwhile new people have moved to the neighborhood and have a completely different vision of what they want. 2) People in these meetings say, hey I want a movie theatre or I want a kids clothing store, an arty bar. A developer buys a property. Maybe creates rental housing with ground floor businesses. The developer is going to rent to the first business that has the cash to rent is storefront. That’s when you get the nail salon or the insurance broker. You may say, hey, I put that lego piece on the map and we all decided we needed… (fill in the blank). 3) People want “affordable housing”. However, affordable housing built as new units yields very little “affordable housing”. Yes the developer may dedicate some units, or, in fastly appreciating areas choose to donate the affordable housing trust fund and not provide any units. 4) Park and open space. Developers could cede some of their development space as landscaped areas, but unless the city is willing to make the investment in purchasing properties to make park space, putting it on a map of the area, doesn’t make it so. 5) Unless the city is going to reclassify its zoning categories and then rezone areas so that it says, for instance you can’t put an auto mechanic with a curb cut on the street. If the zoning continues to allow such a business, you may get that business and not the business you want there. Prime example is in Edgewater they downzoned the B-zoning on Broadway, but the previous B-zoning and the current B-zoning is wide enough to encompass lots of different business types and even strip malls with curb cuts. Don’t want business that are car centric and need curb cuts and parking lots? You might be able to use the Pedestrian Street zoning, but if the current use in the area is strip malls and drive throughs, (banks, pharmacies, restaurants) a lot of current property owners do not want to be non-conforming to the zoning. In some instances it adds to their insurance costs and should a disaster happen, may not be able to rebuild their current business, so they may not want such a change to the zoning. 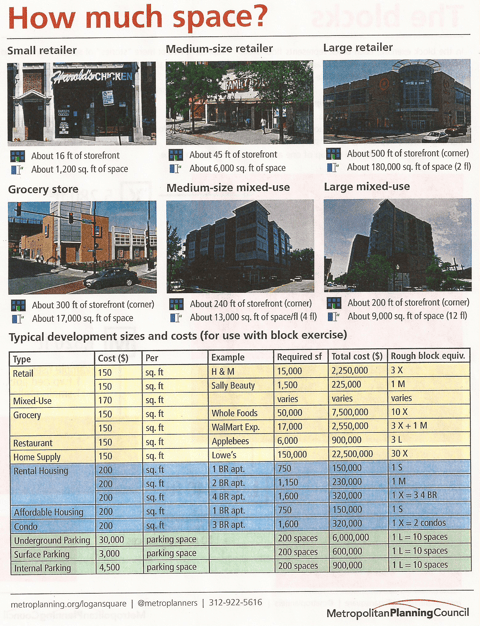 6) The TOD ordinance does not supplant the current zoning for the property. All it does is allow a developer to request a change in parking ratios and adjustments to FAR (floor area ratio) and density. This in an of itself maybe not enough to make a valuable parcel developable for what you want, because perhaps a car dealership with more money to spend outbids the housing developer and if the zoning clearly allows it, that’s maybe what you will get. The folks I talked to at these meetings in general were pragmatic and realistic about how difficult it can be to get something best for the community (However that’s defined). None seemed to think “everything is wonderful”; most recognized that our neighbohood faces significant challenges in keeping the parts of its character that attracted us to it. The developers on-hand to critique our ideas have no incentive to pretend that unprofitable proposals are likely to get built. Most of your specific points actually have nothing to do with this set of meetings, but I’m not going to waste time addressing them individually. I just want to ensure that no one thinking about getting involved in their community is discouraged by such a cynical (and incorrect) view of what these meetings entail. As a former block club president (5 years) and a former member of 48th ward Mary Ann Smith’s zoning and planning committee, I have been to many many similar meetings in Edgewater. I am a big supporter of density and TOD and basically was on the side the got whipped when downzoning of Broadway happened. I’ve seen mass delusion at its best. I don’t mean to sound cynical. But lovely plans are generated by the community that seldom come to fruition. And unless you have strong leadership to develop a plan and keep the plan on track, you get what we have now, which is a mish mash. The downzoning of Broadway spelled the beginning of the end of the Edgewater Community Council which is now defunct. This was an organization that stood for strong development and community for over 25 years. When board members like myself pleaded with Mary Ann Smith not to downzone Broadway and to support TOD, we were undercut by her political need to get re-elected at any cost and listening to the Lakewood Balmoral crowd that cried we’d get six story towers on Broadway if we didn’t downzone lead to a disasterous planning decision which washed away any plans made at meetings like this. As a result many of the long time board members resigned in mass and the organization fell apart. Unfortunately I teach class on Tuesday evenings downtown and could not make it in time. Disappointed as I live right across the street on Kedzie and park in the city lot. I have vested interest but my schedule conflicts exist. Really would have to consider selling or storing car elsewhere if the city parking option is completely pulled off the table. Given how much of Logan is permitted due to the Blue Line and the other parking restrictions, off street parking is so rare in the immediate neighborhood. While I should have had considered this happening, 10 years ago when I bought that lot was marketed as a viable option for many of the smaller condo conversions that occurred along that lot that didn’t already have parking. The building to the north of the lot, the buildings along Emmett street and my building on Kedzie were all allowed to convert to condo without any onsite parking. With the neighborhood now split on Kedzie with different aldermen, I fear my concerns won’t be heard as that development is now part of a new ward. Another resident in my building lost a residential permit as both aldermen claimed the other was in charge and neither would help. Great times in our fine city!?! When I hear “alderman’s zoning committee” and “many similar [to the Logan Square] planning meetings” I’m in disbelief. Meetings like the one MPC arranged with CDOT, DPD, and Alderman Colón are rare. Did you have the opportunity to communicate to city planners about what you feel is appropriate for the site and hear from real estate/development professionals whether it’s feasible from their perspective? These meetings have a very specific purpose that’s not reflected in your comment: communicate to the Chicago Department of Planning and Development and CTA about what they should write into the RFP when it comes time for the city to sell the parking lot and the CTA to develop the plaza.